That was my first impression too honestly. It's so far outside their usual style: The zany art style, the jammin' rock music, even the actual genre of the game. Now with proper scuba gear! This is probably the best Squid Girl game not actually called Squid Girl. The game looks like a lot of fun and all, but I'd be lying if I didn't say that this is about 70% of the reason I'm so interested in this game. I-Block funny!!!!!!! from noitacoL Relationship Status: Chocolate! The game looks pretty darn good. I was watching Nintendo's presentation with a family member of mine today and he said that the game was his favorite game they showed off in that presentation. That gameplay looks amazing. Colour mechanics look like you can punish people who forget you can squid up and swim around in your own colour to backstab them. Quick r34 search: 13 hits on paheal's cousin site. 2 r34 images and some safe ones on Gelbooru. Welp. I don't care at all. It was inevitable anyways. Splatoon somehow reminds me of that Oozinator thing, only with ink guns. 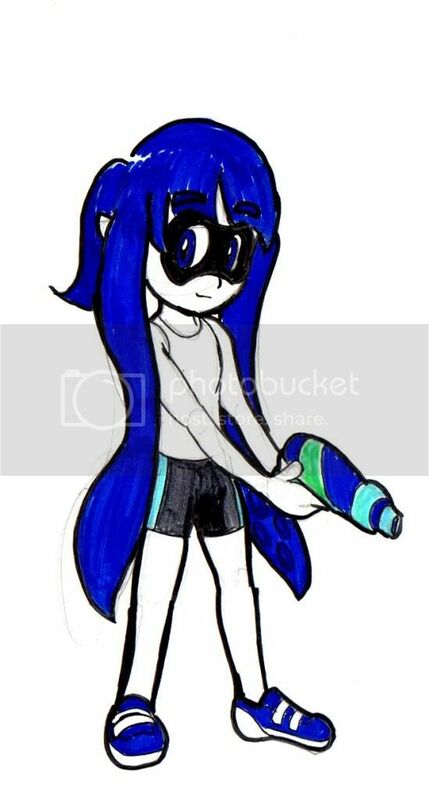 If there's an attack mechanic I would like, it would be a squid melee special that must be down while swimming in the ink. You'd pop out with a strong strike, spy backstab style. Also we need a de_dust or de_dust2 level in this game, stat. Listening to the devs talk, though, it seems very much like a Nintendo game, with gameplay coming first, then aesthetic decisions. Even still, it is very aesthetically different from the usual Nintendo fare. The character designs kind of look like Zelda to me, though. I'm expecting Nintendo's take on ctf_2fort. How? I don't see it. The squidmode inklings look a bit like Bloopers from the Marioverse. I dunno, something about the bangs of the 'hair' and elvish ears on the girl models. Inklings template their human forms after Hylians. Aesthetically this reminds me of Sega, specifically the Dreamcast years (or would that be year). Doesn't look like something Nintendo would make. It seems to play like something they'd make though. Is there a singleplayer mode in this? It would seem very Un-Nintendo not to include one. This is the signature line, right? Why isn't it working? I'm trying to sign this but it's just leaving pen marks all over my computer! It's not in the demo they showed, but I wouldn't be surprised if some kind of campaign came later. I expect to see more of this in future Nintendo Directs. Seriously, even though I am pumped for Far Cry 4, Sunset Overdrive, Rainbow Six Siege, Destiny, and Call Of Duty Advanced Warfare, this game just looks to be so much more creative and intriguing than all of those ones combined. This is probably my most anticipated upcoming shooter now. I've got my money on Splatoon being the next Mario Kart and Super Smash Bros. 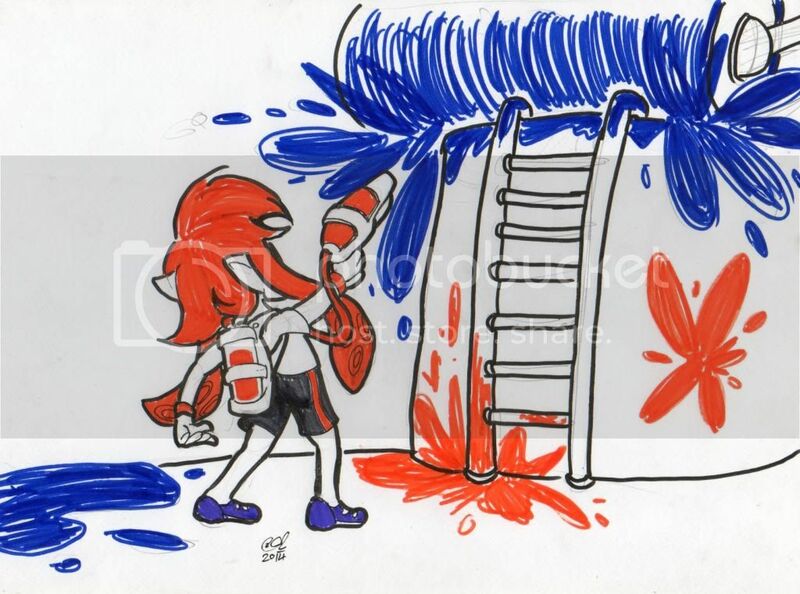 It would be silly not to expect the an Inkling to be a frontrunner for the next Smash Brothers at the very least. IGN interview. And for one of the concerns kinda dodged in the video, full voice chat was confirmed by someone else. Everyone in this game just kind of explodes. It's very violent non-violence. Their human bodies are made of ink, so they don't "die", they just get exploded back into squids. I am very curious about the story of the game. I mean, I'm assuming it'll be an Excuse Plot, but Excuse Plots can still be interesting, like with Team Fortress Two. I want to understand this strange world of squid people and flag-wielding tuxedo cats. I want to know what other color teams they will have. They have Pink vs Teal, Green vs Purple, Blue vs Orange. Do you think they might have other colors? Well, that just makes it all sound silly.